Teach For America is celebrating their twenty-year anniversary this weekend (see Not-To-Be-Missed Reports From Teach For America Celebration). Contrarian that I am, I thought that this would be perfect timing for a “The Best..” list that raising concerns about their work. Last year, when our new Superintendent wanted to invite Teach For American to come to Sacramento, I wrote a fairly extensive post about it — Why I Oppose Teach For America Coming To Sacramento. 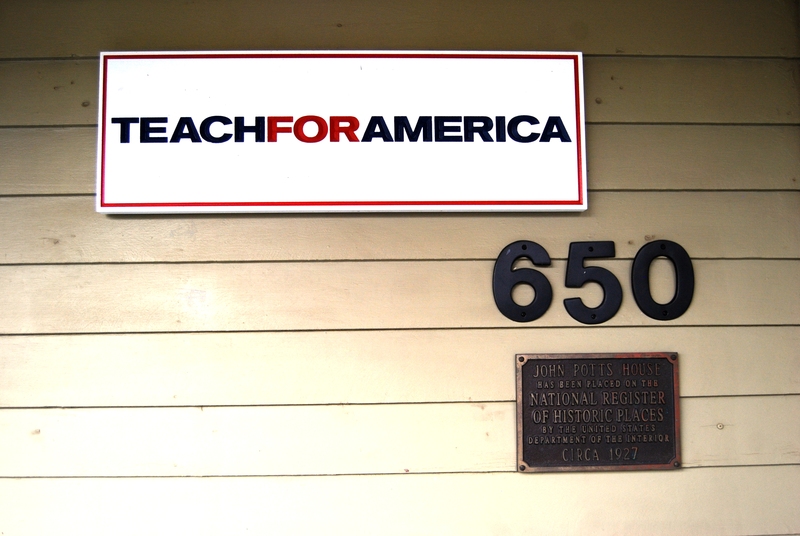 Happily, I was able to write this post shortly afterwards — Teach For America NOT Coming To Sacramento. A new look at Teach for America is by Valerie Strauss at The Washington Post. Why the Love/Hate Relationship with TFA? by Claus von Zastrow offers a somewhat more nuanced view of TFA. Does Teach For America Deliver Systemic Education Reform? is by Anthony Cody at Ed Week. What football can teach school reformers is an interesting guest post at The Washington Post. Teach For America: A Review of the Evidence comes from The National Education Policy Center. Veteran teacher: My problem(s) with Teach For America is from Valerie Strauss’ blog at the Washington Post. Ravitch: The Problem with Teach For America is a post by….Diane Ravitch at Valerie Strauss’ blog. Marie Levey-Pabst: Will the Teach For America Elite Save the Poor? is a guest post in Anthony Cody’s Ed Week blog. Poise & Ivy: Judging Teachers by their Credentials is from Nancy Flanagan. Teach for America alum: TFA’s impact on my school appeared on Valerie Strauss’ blog in The Washington Post. Take Me to Your Leader is by Nancy Flanagan at Ed Week. Teach For America: From Service Group to Industry is by Rachel Levy. What happened to my TFA? is by Gary Rubenstein. An Ordinary Teacher Talks to Teach for America offers some insightful commentary. TFA Founder Kopp Dodges Questions with “Read my book.” is by David B. Cohen. Big expansion, big questions for Teach for America is from The Boston Globe. Huntsville Takes a Closer Look at Teach For America’s “Research” is from Living In Dialogue at Education Week. Philip Kovacs: Teach For America Research Fails the Test is from Living In Dialogue at Ed Week. Research Suggests Teach For America Does Not Belong in Huntsville from Living In Dialogue at Ed Week. Phil Kovacs Responds to the Latest Research on Teach For America is from Ed Week. Deepening the Debate over Teach For America is from Anthony Cody at Education Week. TFA Teachers: How Long Do They Teach? Why Do They Leave? is from Education Week. Retooling Teach For America is from The Los Angeles Times. Has Teach for America betrayed its mission? is from NBC. Perpetuating Inequity: New Study Shows Attrition a Huge Problem for TFA recruits is from Reconsidering TFA. Wendy Fails ‘The Giggle Test’ is by Gary Rubenstein. Why California Tightened Oversight of New Teachers is from Diane Ravitch’s blog. TFA Faces a California Showdown Over Qualifications to Teach English Learners is by Anthony Cody. More Vetoes of Teach For America Needed is from John Wilson. The Fight Ahead is by EduShyster, and is a very good piece on Teach For America. Teach for America criticized for apparent stance on education policy is from The Los Angeles Times. TFA Teachers Perform Well in a New Study — But Teacher Experience Still Matters is by Dana Goldstein. On the New TFA Study: People, Calm Down! is by Jersey Jazzman. Forever young: the new teaching career is by Mike Rose. Top Ten Reasons Not to Contract With Teach For America is from John Wilson at Education Week. Teach for America rises as political powerhouse is from Politico. I Won’t Say ‘Don’t Join Teach For America’ (Yet) is by Camika Royal. What’s TFA’s Role In Mass Dismissals of Teachers? is by John Thompson. TFA in Newark: “Act as if the facts matter” is from The Commonal. This took Teach For America 24 years to figure out? is by Valerie Strauss. A Primer for Engaging Teach For America Supporters is from Cloaking Inequity. Has Teach for America reached its Waterloo? is by Amy Dean. Teachers are losing their jobs, but Teach for America’s expanding. What’s wrong with that? is from The Hechinger Report. Teach for America has faced criticism for years is from Vox and by Dana Goldstein, and is quite interesting. It offers a different perspective. Reinventing Teach For America is by Jack Schneider at Ed Week. This Is What Happens When You Criticize Teach for America is from The Nation. Teach For America At 25: With Maturity, New Pressure To Change is from NPR. The True Cost of Teach For America’s Impact on Urban Schools is from The American Prospect. Why Teach for America is suddenly having trouble recruiting college students is from The Washington Post. Fewer Top Graduates Want to Join Teach for America is from The New York Times. Teachers in Teach for America aren’t any better than other teachers when it comes to kids’ test scores is from The Washington Post. Teach For America Sees Another Big Drop In Accepted Corps Members is from The Huffington Post. He’s the stinkweed at the Teach for America garden party is from The Washington Post. Is America’s Most Controversial Education Group Changing Its Ways? is from Mother Jones. Study examines Teach For America’s impact on costs, hiring at 5 school systems is from Eureka Alert. Big trouble at Teach For America? is from The Washington Post and Why Teach for America Is Scrapping Its National Diversity Office is from The Atlantic. Teach for America applications fall again, diving 35 percent in three years is from The Washington Post. SF school leaders give Teach for America a time-out is from The San Francisco Chronicle. Teach for America Has Gone Global, and Its Board Has Strange Ideas About What Poor Kids Need is from The Nation. Public school strikes revive clash with Teach for America is from the Associated Press. Teach For America — except for California is from Politico. You wrote a great post. Thanks for sharing it!